In a season where top five teams seem to fall everyday Gonzaga has been like a rock. They are undefeated inside the West Coast Conference and their only losses have been to previously ranked Illinois and Butler. Then this Sunday, they got a huge reward as the polls placed them as number one for the first time in school history. 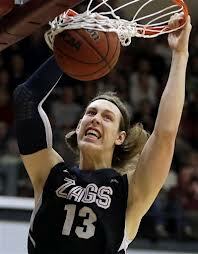 But, the question remains, are the 'Zags true title contenders or just a strong team from a weak conference? First things first, we have to look at their schedule to this point. They have only beat two ranked teams this whole season in Kansas State and a one point victory over Oklahoma State. They have dominated weak teams like West Virginia by 34, Portland by 29 and Loyola Marymont by 35. But, other top five teams can beat those teams just as easily as well. The Bulldogs and coach Mark Few are smart, rarely settling for tough shots. In fact, that plan of attack has led to Gonzaga having a .505 field goal percentage, which is 3rd best in the nation. They have a dominant low post presence in seven-footer Kelly Olynyk, who averages 17.7 points per game and can clean up the glass well recording seven boards a game. As good as a season as it has been for Few and Gonzaga the season has to be measured by how they finish up in the NCAA tournament. If the Bulldogs went up against say, a Duke or Indiana they would actually match up well. Olynyk could stifle beasts like Plumlee or Zeller and point guard Kevin Pangos has the speed, smarts and court vision to hang with any point guard in the nation. Considering they are undefeated inside the WCC (even if it is a weak conference) and have just two losses in this crazy season they probably deserve the number one ranking and shouldn't be considered overrated. But, as far as the tournament goes, the Bulldogs still have a lot to prove. They can get to the Elite Eight without too many troubles but they need big games from Wooden Award candidate Olynyk, Pangos and forward Elias Harris in order to get to Atlanta.